The model M66V is a self-contained media air cleaning system designed for use in source capture applications where mobility is desired. In Extrusion and Injection molding applications this system is a good choice to roll in place where machine maintenance is being performed so smoke & fumes can be captured at the point where work is being done. The 13 ft moveable arm can be easily swung into position for source capture creating a safer work environment. The M66V can also be used in parts torching and welding operations. 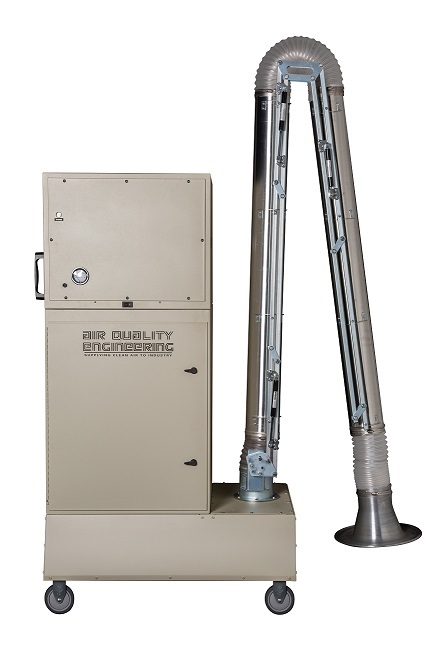 The M66 can be ordered in a three-stage filtration configuration which will effectively remove a broad range of airborne contaminants including fine dust, smoke, soot, vapors, mist, VOC’s and more at a rate of up to 2000 CFM.